We also offer special Lighting Packages for Weddings. Base packages and upgrades are available. Contact us for pricing and details! Decorative Lighting is used in Canopy Tents and some Large Pole Tents. Decorative Lighting is a white strand with 1" candelabra style bulbs every 12 inches. This lighting is draped from the corners and through the center of the tent. Frame Tent Globe Lights are specially designed for our High Peak Frame Tents. Each Frame Tent Globe Light has 4 large white globe lights. 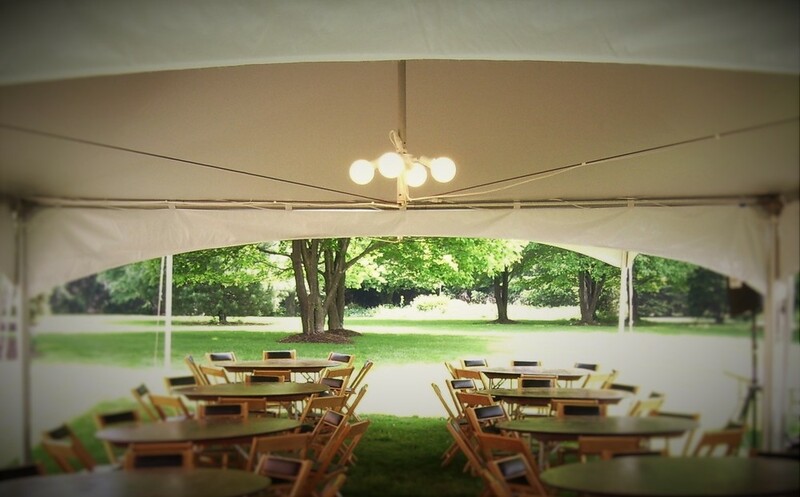 The Frame Tent Globe Light is suspended in the center of each 20'x20' tent. Standing Lights can be set up anywhere you need some extra light. They are great for lighting pathways or the perimeter of your event space. Each Standing Light has 4 Large Frosted Globes. Can be used indoors or outdoors.